Ben Bernanke is no fan of Bernie Sanders and his "delusions." Bernanke and Sanders never saw eye to eye during the financial crisis. And Bernanke now -- unencumbered by any government titles -- has liberty to speak his mind about the presidential candidate from Vermont. 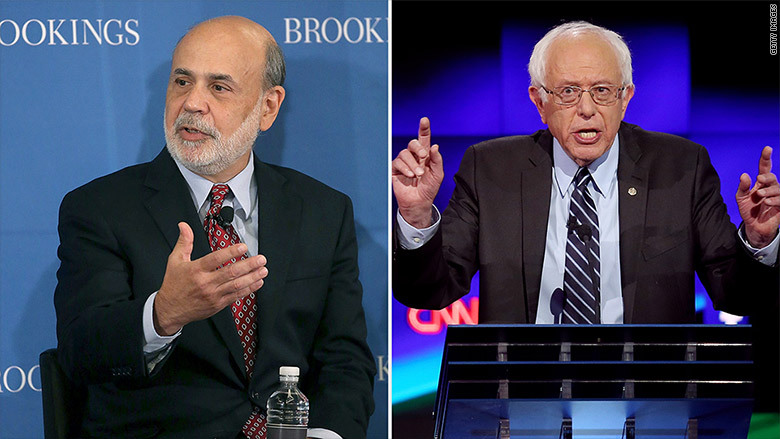 On Wednesday Bernanke threw a subtle verbal jab at Sanders. It was another sign of a longstanding feud between the two. Sanders had lambasted Bernanke, the former Federal Reserve chairman, for bailing out Wall Street banks in what he saw as helping the rich while middle class Americans suffered. In an Op-Ed titled "Bernanke must go," Sanders wrote that he wouldn't vote to confirm the Fed chair for another term. Sanders also pushed to regularly audit the Fed. Now it's Bernanke's turn to dial up the criticism. Bernanke explicitly called out Sanders in his newly released book, The Courage to Act. He says that far-left Democrats "suffered their own delusions" about the facts of the financial crisis. In the very next sentence he says: "Senator Bernie Sanders of Vermont...seemed to see the world as a vast conspiracy of big corporations and the wealthy." 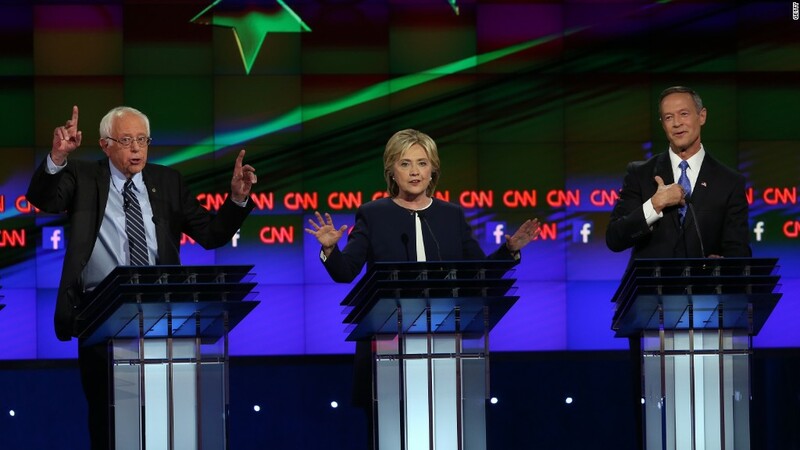 In the last CNN Democratic debate, one topic that got surfaced several times was the Glass-Steagall Act, a major piece of Depression Era banking law that was in place from 1933 to 1999. Sanders said he wants it reinstated. For years, he has blamed a repeal of the law for the financial crisis. To Bernanke, the fact that Sanders is still talking about it is a head-scratcher. He said as much on Wednesday. "I'm actually a little puzzled by the focus on [Glass-Steagall]," in the presidential campaign, Bernanke said at a Politico-organized event in New York. "If you look at what happened a few years ago in the crisis, Glass-Steagall was pretty irrelevant to it." Sanders conjures up Glass-Steagall, because when the law was repealed it allowed banks to do business with both Main Street and Wall Street. It led to a lot of big bank mergers and many like Sanders believe it led financial institutions to get too large and take on too many risks. However, to Bernanke's point, when you look at the actual financial institution failures in 2008, Glass-Steagall's role was not prominent. The first two large institutions to fail were Bear Stearns and Lehman Brothers, both of which only served Wall Street, not Main Street. Bernanke not only disagrees with Sanders on fundamental issues, he says Sanders' style of politics is bad for the U.S. government. He argues that Sanders and others in Congress used public anger during the financial crisis to blur the facts of the crisis and the Fed's role. "A dose of populism is healthy for any democracy," Bernanke writes, "But in extreme forms, populism can also lead to cynical manipulation of legitimate public anger...when these aspect of populism dominate political discourse, good governance is nearly impossible."